Rev. John F. Brown, CSV, died on March 14, 1983, at the Holy Family Health Center in Des Plaines, Illinois. Father Brown had been hospitalized since December 31, 1982. 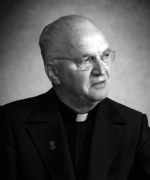 Father Brown was 74 years old, and had been a member of the community for 52 years and a priest for 45 years. A wake was held at the Province Center Chapel, 1212 E. Euclid Street, Arlington Heights, Illinois, on Wednesday, March 16, 1983 at which Brother Donald Houde was the homilist. On Thursday, March 17, 1983 a wake was also held at St. Anne Church in St. Anne, Illinois. Father Kenneth Morris, Provincial, was the homilist at the Liturgical Service. The Mass of Christian Burial was celebrated at St. Anne Church on Friday, March 18, 1983 with Father Morris as principal celebrant and Father John Linnan as homilist. More than fifty Viatorians, diocesan and religious priests concelebrated the funeral Mass. Bishop Daniel Ryan, Auxiliary Bishop represented the Diocese of Joliet, and gave the final absolution. Burial followed the funeral services in the community plot in Queen of Heaven Cemetery, Hillside, Illinois. Please remember Father Brown in your masses and prayers. Taken from Viatorian Newsletter #599-2, March, 1983 and a Provincial letter from Rev. Kenneth Morris, CSV.